Strictly for 6 year olds, this uninspired, one-joke comedy is full of too many misfired gags and weak comic setups to cross over to anyone whose head reaches above the seat back. With Dwayne Johnson starring as a washed-up hockey player whose bad behavior to a young fan gets him magically sentenced to working two weeks as a tooth fairy, box office prospects may actually be bright due to lack of new family film competition and the appeal of Johnson, who tries hard but doesn’t score any acting points with this one. Johnson has been building a nifty secondary career toplining family films and has succeeded nicely in Disney projects like The Game Plan and Return To Witch Mountain. He’s also shown strong comic chops in movies like Get Smart, so it must have seemed irresistible to put him in a shiny velvet outfit that sprouts wings and turns him into a tooth fairy at inopportune times. As Derek Thompson, a player nicknamed ‘tooth fairy’ for his dubious talent knocking out opponents teeth, Johnson is a bit overbearing in his seemingly desperate need to make us laugh. What little plot there is serves as a repository for a lot of hoary old gags as Thompson is somehow summoned to fairy land (don’t ask), admonished by matriarch Lily (Julie Andrews) and then forced to serve two weeks as a tooth fairy due to his boorish behavior on and off the ice. With clumsy but lovable case worker Tracy (Stephen Merchant) assigned to watch over him, he first has to get outfitted with a series of gadgets provided by Fairyland’s resident jack-of-all-trades, Jerry (the unbilled Billy Crystal), who throws off every old vaudeville gag, providing Derek with the likes of shrinking paste (reduces him to six inches), a not-so-magic wand, amnesia dust so people will forget they ever saw him and “Cat Away,” a spray can guaranteed to take care of the pesky household pets. His fairy gig gets particularly complicated as he deals with his new girlfriend (Ashley Judd) and her kids. Michael Lembeck, best known for directing sitcoms, tries to navigate his way through a dreadfully unfunny script by no less than six writers, and is forced to rely far too much on the charms of his cast to get by. Johnson is definitely a capable comedic actor but here he just seems to be floating through the part, trying too hard to keep a straight face. Crystal, in for one scene and some end credit goodies (actually funnier than anything in the movie), wisely doesn’t take billing. Judd is thoroughly wasted in a one-dimensional role, while an ideally-cast Andrews manages to be the only one who keeps her dignity intact. Johnson’s antics on the ice are mildly amusing but the film gets too bogged down in his various hairy fairy outings that too often fizzle when they should sizzle. Only the youngest family members will want to spend their hard-earned tooth money to see this lame fantasy comedy. 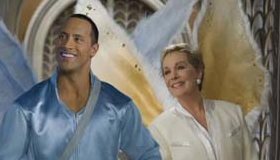 Cast: Dwayne Johnson, Ashley Judd, Julie Andrews, Stephen Merchant, Ryan Sheckler and Billy Crystal. Rating: PG for mild language, some rude humor and sports action.